Just Jingle: Shake It Up! Happy Wednesday, friends! This week we are SHAKING IT UP with Simon Says Stamp for the Wednesday Challenge! The Design Team is using We R Memory Keepers products this week. You don't have to use them to play along, but if you have some, we'd love to see what you do with them! I pulled out my Fuse Tool to create a one of a kind pineapple shaker. 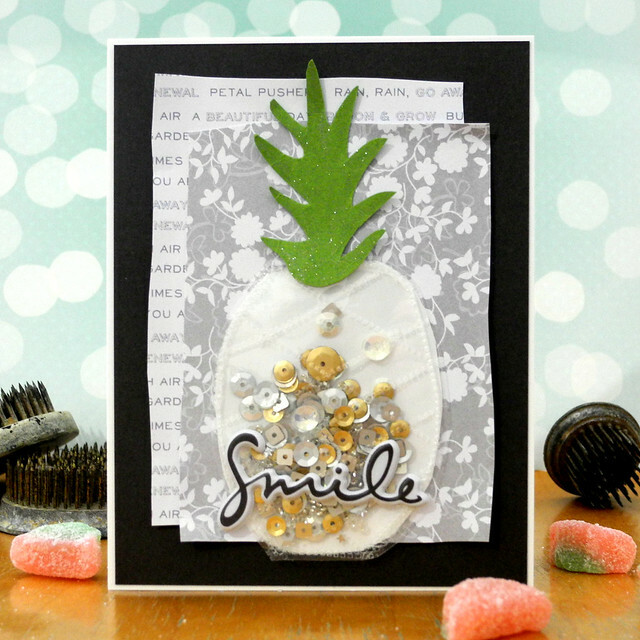 I added cardstock below the first layer to create the pattern on the pineapple, and then removed the card so that I could fuse the edges of the pineapple. 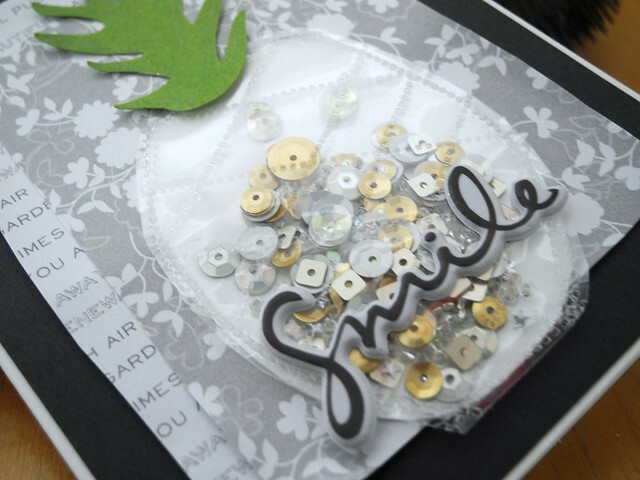 I filled it with super fun sequins and beads from Lucy's Cards. I love these sets! They are so perfect for shakers! For this card, I decided to play with the inside a bit, too! I used the We R Memory Keepers Gift Bag Pop-Up to create a gift card holder inside my card. I used some pineapple vellum to keep with my theme. This was SO much fun to make! This is designed to hold a gift card perfectly! You can use it as a pop-up in a card or by itself. Now it's your turn! Create an awesome project featuring a shaker of some kind and link it up to the Simon Says Stamp Wednesday Challenge blog for your chance to win a $50 Gift Voucher to the Simon Says Stamp Store! Woot! Woot! You are so creative, Jennifer! Just love your take on this week's challenge! This is fantastic, Jennifer! So creative! I love it! A fabulous set Jennifer, a gorgeous gift bag, perfect for the cute pineapple card with super shaker and sequins!! luv this Jingle....adorable! hope you have a FAB weekend! I LOVE you shaker pineapple on your card. Just gorgeous. This card rocks in all sorts of ways. 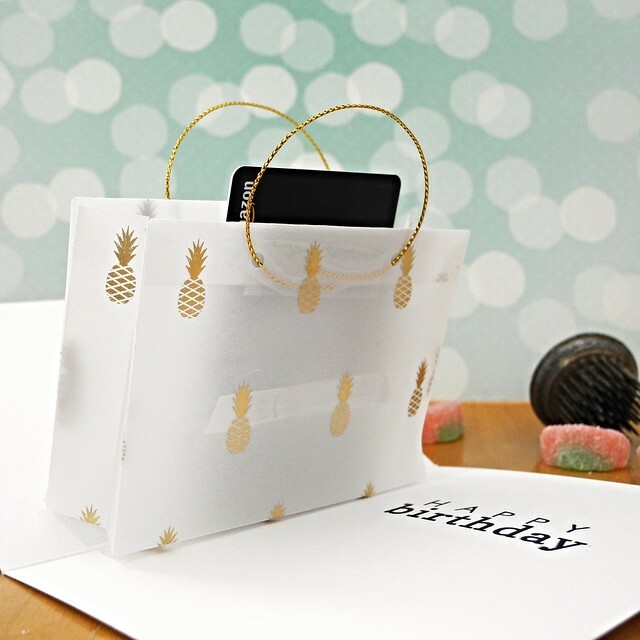 I am in love with the pineapple shaker and then the little bag inside, so cute with the pineapple paper! Pineapples are SO HOT!! Love this pineapple shaker... so fun!! I don't know why I haven't seen that bag die before. LOVE your card inside and out! WHAAAAT? That's fabulous! My mind is blown!! Such a fabulous card Jennifer!! Amazing design! !